The G-8 Summit opened on Sea Island, Georgia on Tuesday, June 8,2004. 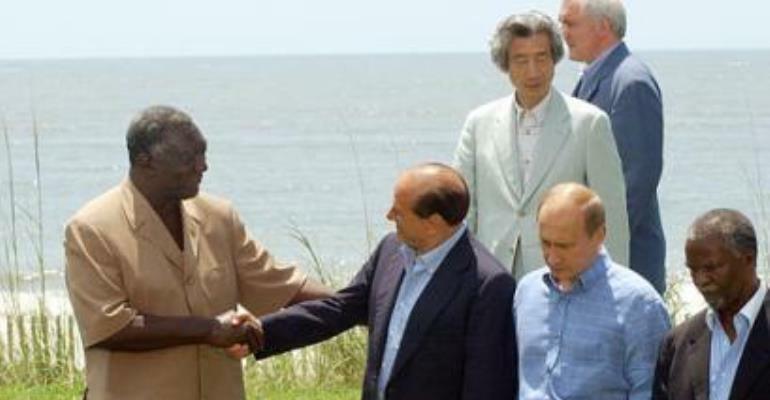 President Kufuor who is one of five African leaders specially invited for the summit arrived in Georgia at approximately 23:00hrs on the same day. The Press Secretary to the President and Presidential Spokesman Kwabena Agyei Agyepong who is in the President's team described the Ghanaian leader as "upbeat and and looking forward" to the delibrations. The key areas President Kufuor and his colleague African leaders discussed with the G8 leaders included a new initiative to combat famine especially in the Horn of Africa through an initiative called "Ending the Cycle of Famine in the Horn of Africa. The"commitment by the G-8 to eradicate polio by 2005 and an announcement by the G8 endorsing the establishment of a global HIV vaccine enterprise, to accelerate the development of an HIV vaccine was also high on the agenda of the meeting. The Press Secretary said the G-8 Summit is expected to reach a consensus on an innovative global program to combat poverty with private entrepreneurship and the introduction of measures to cut down the costs of remittances from immigrants in rich countries to developing countries by half. Mr Agyepong said one other key area in which agreement is to be reached at the summit is finding ways by which the rich countries of the world can help improve the business climate for entrepreneurs and investors in developing countries. Some of the measures expected in this direction include encouraging multilateral development banks to increase lending and technical assistance to small businesses to help create jobs and urge developing countries to step up efforts to combat piracy and counterfeit intellectual property. The G8 countries are the US, Japan, Germany, France, Britain, Italy, Canada and Russia. Debt relief for African nations is an important topic, hence the presence of Ghana's President Kufuor and others. The G8 leaders also have plans to train and equip more than 50,000 peacekeepers over the next five years, particularly for deployment in Africa. This initiative has grown out of African requests for assistance in ending the civil wars plaguing the continent. There is tight security at the venue of the summit. US authorities have sealed off Sea Island amid fears that the summit could be one of several high-profile events in the country this summer targeted by Osama Bin Laden's al-Qaeda network. Only those with high-level credentials are being allowed into the secluded resort. About five miles (8km) long and two miles (1.3km) wide, the private island can be reached only by a two-lane causeway - or from the Atlantic Ocean. Concrete barriers, metal fencing and checkpoints have been put in place around key buildings and routes on the mainland and surrounding islands. Thousands of police officers and National Guard troops are patrolling roads and bridge while military aircraft and gunboats have also been deployed. Local people in the mainland city of Savannah are relieved that there are unlikely to be large-scale anti-globalisation protests this time - a feature of previous G8 summits. G8 leaders ready to hear Kufuor The leaders of the Group of Eight (G8) developed countries will hold a wrap-up session today. During lunch, Presiden Kufuor and leaders from Algeria, Nigeria, Senegal, South Africa and Uganda will join the G8 members. Doing more to combat the spread of HIV on the African continent and spurring economic growth there will be central topics of today's summit being held on the Sea Island off the state of Georgia in the US. Kufuor and his African colleagues are expected to raise the topic of subsidies in their luncheon meeting. Africa has demanded that developed nations cut the huge subsidies that they pay their farmers - estimated at $300 billion (R1.98 trillion) a year - as they undercut Africa's products on local and global markets. Earlier in the week, National Security Advisor Condoleezza Rice said inviting the African nations to this year's summit illustrated Bush's continued support for the New Partnership for Africa's Development and the Africa Action Plan. The New Partnership is a 3-year-old effort aimed at reducing poverty and promoting economic development, integrating Africa into the world economy and empowering women.